This Karaṇa is second in order. Bharata’s Nāṭyaśāstra defines this karaṇa as follows. Hands that are bent at the wrist should be rotated in Vyāvṛtta mode and again in Parivartita mode. Then they should be placed on the thigh. This karaṇa is called as Vartita. Abhinavabhāratī further explains as “two hands should be placed at the chest level without sticking each other like svastika (crossed) manner and the Vyāvartana and Parivartana should be done at the same time. Then the hands should be placed on the thigh with raised hands. Patāka hasta can be used to denote jealous (Asūyā) and the same can be used facing down to denote anger. Khaṭakāmukha and śukatuṇḍa could be used according to the situation. Somebody say Agratala sañcara should be used. But according to the masters of Abhinavagupta, appropriate pāda can be used. 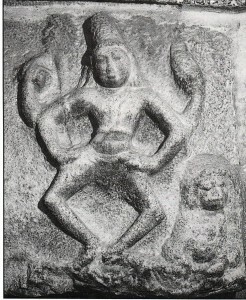 In the panel at Tañjāvūr, śiva has four hands. The upper hands have ḍamaru and fire. The lower hands are placed on thigh in a closed manner. 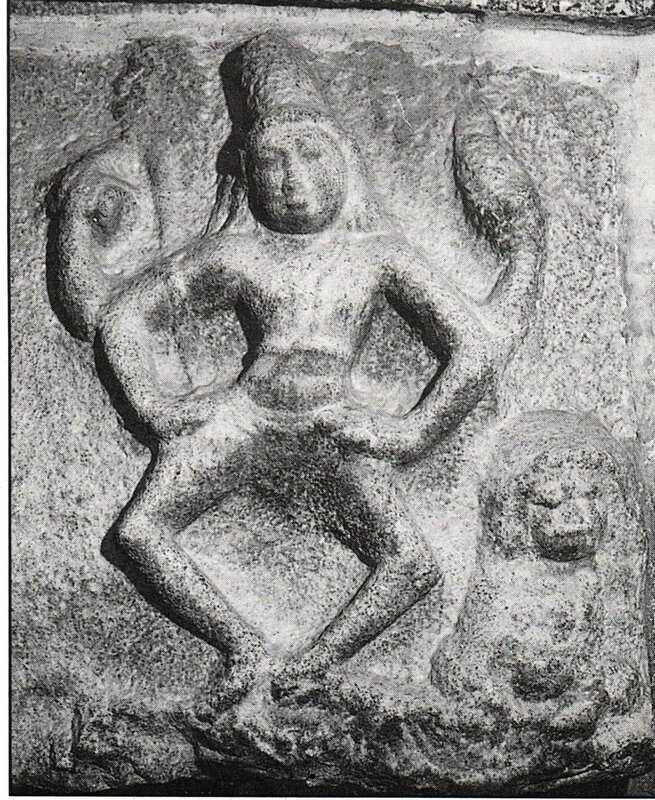 Legs are in maṇḍala position and right leg is in agratala sañcara position which is seen in Talapuṣpapuṭa karaṇa. All these follow the description of Nāṭyaśāstra and the closed position of hads on thigh can be connected with the second type explained in Abhinavabhāratī. I hereby suggest that Adhrardhikā cārī ending in Agratala sañcara could have been followed in Tañjāvūr karaṇa. Iconography Bharata, Karaṇa, Natya Sastra, SCULPTURE, Thanjavur. permalink.